Obviously, I was not in a great place when I obtained the Deluxe Steerable Walker Alternative. I had just gone through surgery on my foot and was skeptical of scooting myself around the grocery store, my office, and other public places on something that was sure to attract a good deal of attention. The scooter did seem a better option than the alternatives, though. When I first received the product, I was impressed with how easy it was to learn. It came with detailed instructions and did not take much effort to get ready for use. It is also easy to break down for when I needed to leave the house and easy to put back together when I arrive at the destination. It was a bit awkward assembling the scooter in a parking lot with help from my wife, but after we did it three or four times we were able to put it together very quickly. When I first received the product, I checked to make sure I had all of the parts. I did. If you are not very handy, make sure you follow the assembly instructions closely or else you may get lost. The directions are easy to follow once you understand the format- each company that makes self-assembled products seems to have their own way of describing assembly and this manufacturer is no different. I figured it out and got the thing put together in about fifteen minutes. Deluxe Steerable Knee Walker Knee Scooter is easy to break down and easy to put back together. After fidgeting with the brakes and getting used to the steering mechanism, I began slowly making my way around my apartment. It definitely took some getting used to. At first, I was overcompensating when steering left and right and constantly had to correct myself. The brakes also took some getting used to. I learned not to clamp the brake to hard because if you stop very suddenly, there is a chance you will be thrown from the scooter. That never happened to me, luckily. 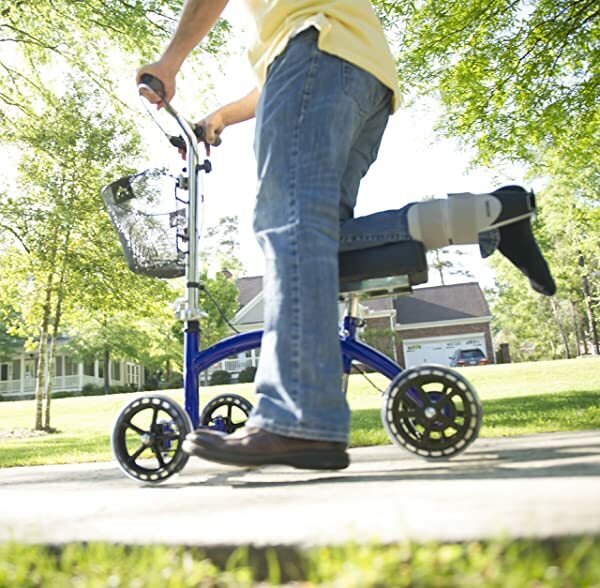 Once you become comfortable with both the steering and braking, the scooter is very easy to use and is quite effective for getting around without causing pain to your injured leg or foot. I was able to use the scooter intermittently all day without feeling worn out by it or otherwise distressed. One thing I liked very much about Deluxe Steerable Knee Walker Knee Scooter is that I never seemed to lose control of how fast or slow I was going. This is because of the wide front wheelbase. I also liked the hand brake. Everything involved with this scooter is operable by hand, a very well thought-out design that makes me think the product’s designers had themselves been through a knee or foot surgery. When using on a sloped surface or over small bumps such as flat escalators or entering the elevator at the hospital, the scooter ate up the shock so that no pain was caused to my foot. The wheels and joints are well put together so that the ride is smooth and never bumpy or otherwise uncomfortable. On carpet, the scooter rides slower but still manages to progress without too much extra effort. One thing to watch out for is brick or tiled surfaces- make sure you pay attention to the contours and keep a firm handle on the brake. 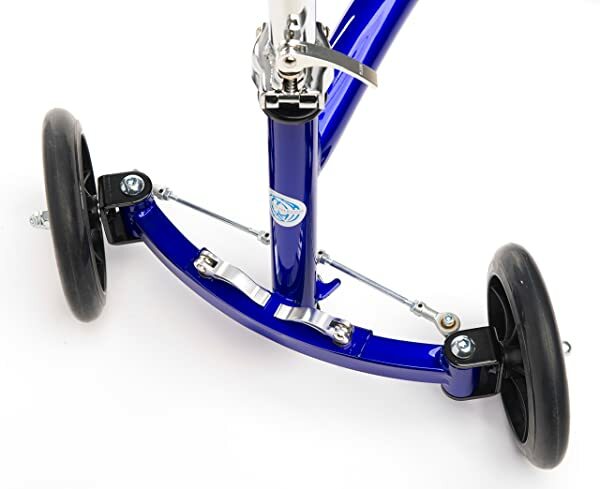 Unlike many other scooters, the front wheels are not axle mounted on this product. 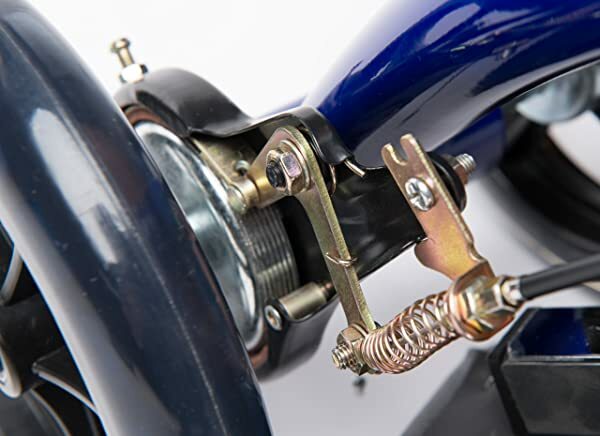 They connect with tie rods and adjusting the wheels can be frustrating. The rods can be adjusted but lining them up correctly can be a challenge. The rear wheels are very narrow which makes for easy and smooth maneuverability- one of the best things about this scooter. When turning, the scooter is more stable than any other scooter I have tried. It never lifted up off two wheels or tilted my body at all. The parts are of a good quality and have not broken or needed repair after the initial adjustment to my size and weight. This scooter is good for most body types and sizes. It is very flexible and does not seem to cater to a particular height, within reason. If you are between 5’ and 6’5” this product will suit you well. At work, at home, and in other day to day occurrences this scooter has been very reliable and made my injury much more manageable. You will find that this product does everything that it says it does, which is exactly what needs to happen when dealing with an injury. The wheels are 7.5” durable non-marking rubber and have not caused any scuff marks in my apartment or elsewhere. The 3.5” thick contoured knee platform is compatible with either leg and is soft and comfortable. When transporting, the front handlebars are easily removed and then the scooter folds up nicely and is easy to carry. Coming at around Currently Not Available*, this scooter is a good value. The cheaper options are not as durable and have a much higher likelihood of breaking and/or needing frequent repairs. Over the years, I have developed a sense of whether or not I made the right decision on a purchase and the overall feeling with this product has been that it was definitely the right option. It has not caused any problems and has served its purpose well. I am happy that I bought this product. It has proved both convenient and effective. 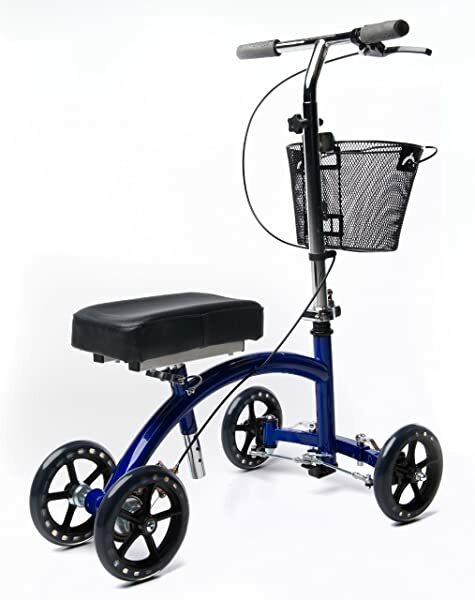 I recommend it over crutches and other scooters because it is easy to use, transport, and store. Compared with crutches, you can move around quicker and with virtually zero strain on your injury. You will not have to worry about accidentally stepping in a pothole, a slanted surface, or about something rubbing or bumping against your injury. If you have pets or toddlers in your household, this is especially helpful. As I mentioned earlier, I was worried about the scooter drawing unwanted attention. While it did get some stares in public, the few people that actually commented had been through leg or foot injuries themselves and wished they had this scooter as an option. If you or a loved one are dealing with an injury that necessitates walking assistance, do not hesitate to buy Deluxe Steerable Knee Walker Knee Scooter. It will be a comforting and rewarding decision.